Eurespla is a medicine that treats the cough. It is used both for children and adults. It will withdraw from the Moldova's pharmacies. According to the representatives of the National Agency of Medicines, this substance contains syrop and tablets that cause cardiac arthritis. The authorities of our country decided to withdraw this pills because so did the European authorities on their market. "These drugs are withdrawn by each keeper from the distributor, from the pharmacies, quarantined, and each, according to his internal procedures, manages the cases, or destroys them at the Medicines Agency or returns them." "said Lina Gudima, head of the Drug Agency's vigilance department. "It is an anti-inflammatory, a preparation that is most commonly used in respiratory infections, often laryngitis, transfusions, obstructive bronchitis sometimes." It had antiinflammatory, expectoral and mucolytic effect and had a beneficial effect on the inflammatory process in the airways. help this syrup somehow in the case of dry cakes to make it easy to moisten it, "said Dorina Agaghi, pediatrician. There was no prescription needed for the medicine, so the medicine was widely used by the sick. "It is not a preparation that is included in the National Protocol as a first-line preparation." It was a well-described preparation by the distributors, the doctors arrived to know it was on the pharmaceutical market, some parents used it only from hearing without medical advice, said Dorina Agaghi, pediatrician. 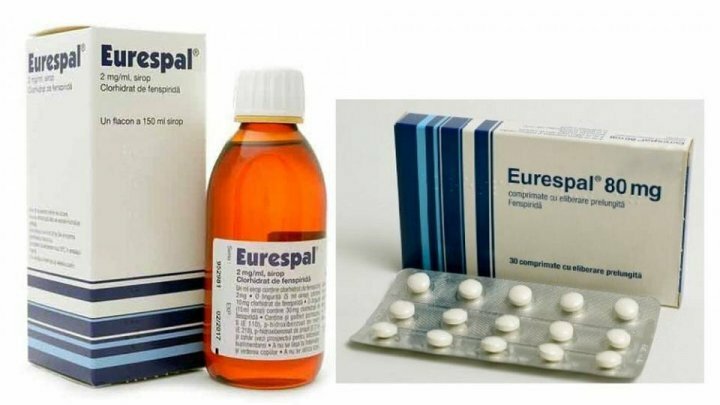 Eurespal retreat from the European pharmaceutical market began after the manufacturer of the drug discovered that the active substance in the medicine, called fenisipiride, can cause heart problems, the French media reported. The French Regulatory and Control Authority has triggered a European Union emergency procedure. Thus, the subject is on the agenda of the European Medicines Agency's Pharmacovigilance Risk Assessment Committee, which is underway during this period. The manufacturer was asked to introduce further details on adverse reactions up to 27 February 2019. Among these would be changes in blood pressure and respiratory difficulties.